Skyfall opens with Bond wearing a black and white pick-and-pick suit from Tom Ford. Also known as sharkskin, this semi-solid pattern woven in an even twill weave looks like tiny steps going up the suit. We’ve seen the pick-and-pick suit on Bond before, in From Russia with Love and in The World is Not Enough. As opposed to a solid medium grey, which can look very flat, the pick-and-pick is far more interesting. This is one of four excellent cloths that costume designer Jany Temime chose the suits in Skyfall. The opening sequence is full of action and a suit is quite impractical for the scene. We don’t know why Bond is wearing a suit, for any other reason than being James Bond. The jacket has a very close fit with a length that comes short of covering his behind, a very fashionable look for the past few years. The shoulders are straight but narrow. 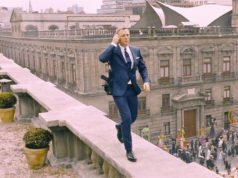 Bond keeps the jacket open since the tight fit makes the action sequences difficult, but it looks better open instead of binding when closed. Some jackets were made with longer sleeves for when Bond is on a motorcycle, so when his arms are extended it doesn’t look like his sleeves ride up. It buttons three down the front and matches with three buttons on the cuffs, and Bond leaves the last button open. The flapped pockets are on a shallow slant and the back of the jacket has a single vent. The trousers have a flat front with side adjusters, though it looks like they tend to slip down. They are cut with a narrow leg and a low rise, and the bottoms have turn ups. The hem is very short, but because the trousers are narrow and he’s wearing a boot they still break. Bond wears a white Tom Ford shirt with a tab collar, placket and double cuffs. The Tom Ford tie has a complex black and silver check pattern that resembles a grenadine weave. The narrow tie is tied in a four-in-hand knot, which fits very nicely in the tab collar. Bond wears a folded white handkerchief in his breast pocket. Bond’s boots are the Crockett & Jones Tetbury model, a black calf, two-eyelet chukka boot with a Dainite sole. Chukka boots, even in black, are too informal to wear with a suit and would be better worn with a sports coat or a casual ensemble. But Bond has always been one to wear casual footwear with his worsted suits, as Fleming prescribed moccasins for Bond in his novels. Chukka boots have a similar level of formality to moccasin-style slip-ons, though both are equally incongruous with a worsted suit. In the scene pictured above, Bond does what Bond does and adjusts his cuff after getting shook up. But it looks like other parts of his outfit could use a bit more adjustment. I don’t think the narrow shoulder does Craig any favours. If anything they make him look smaller than he is. Which in turn makes his arms look bulging. He would look far better (and bigger) if he wasn’t busting out of it. Trousers look very low too. Matt, could you explain ‘rise’ to me please? Rise is the distance from the crutch to the waistband (some measure it to the top of the waistband and some to the bottom). Is the unsightly folding of his shirt over the top of this trousers linked to the low rise? Is there a way to avoid it? Yes. The best way to avoid it is to wear trousers with a longer rise. I am not really fond of the tab collar here. Not sure why it was chosen, since I don’t recall 007 ever sporting one. I can say that a English costume designer would probably never have chosen the tab collar. Temime might have been going for a 1960’s look, but that would be more of an American 1960’s look. Beautiful cloth, questionable cut. Also, I’m not crazy about the narrow tie. When all is said and done, I prefer the beautiful knots, the drape, in one word, the richness of Sir Roger’s 1970’s ties. So sue me! It seems as though Temime had More The Man From Uncle in mind than James Bond. But everything’s too tight. How can you have that lean sharp look if it’s all being pulled out of smooth and straight. Really late to the discussion. Sorry. As to why it was chosen, from the tab collars of Bond (the only character in the film to wear one) to the pagoda shoulders of Mallory’s suits, the director and designers are using the clothes to subtly tell you something about the characters. And thanks for the wonderful write-ups, Matt! Arranging the cufflink in this scene is a subtle equivalent of Brosnan-Bond fixing his tie knot underwater or on the tank. But Connery-Bond would never have to do this wearing cocktail cuffs, chosen exactly for that reason: that Bond would never have to bother with his cufflinks when involved in some action stunt. So many well-thought ideas of the past seem to have no place in today’s Bond. The cufflink adjustment is a great Bond moment, reminded me of Brosnan straightening his tie as well. Tab collars seem to have come back into fashion recently, perhaps as a result of Boardwalk Empire, but they aren’t something that I see the Bond character (particularly his literary incarnation) wearing, I think he’d probably look at them as a little too fussy. I suppose the same argument could be made for cufflinks as well, Connery and Moore usually didn’t wear them with lounge suits, but I’m a big fan and frequently do so (child of the Brosnan era!) so I’ll let that one go. Speaking of which, I was hoping that we’d get a look at the links with the Bond family crest on them, as seen in the recent auction, but we never do, that’s a shame. Regarding this suit, the cloth is beautiful, I just wish they had used more of it! What was wrong with the “Quantum” cut? Wish they’d either kept that, went back to Brioni, or gone to an English tailor like whomever it was that dressed Ralph Fiennes! The change of cut is probably due to the fact that there is a new costume designer on this film and she “starts from scratch” so to speak. I liked the Quantum cut, the ticket pocket especially was a nice british touch (I didn’t like the 3-button lapels that are rolled down like a 2-button though). It’s nice that Bond goes back to some more interesting and Bondian fabrics in this film, to me the fabrics in QoS and especially in CR looked very boring and lacked character. 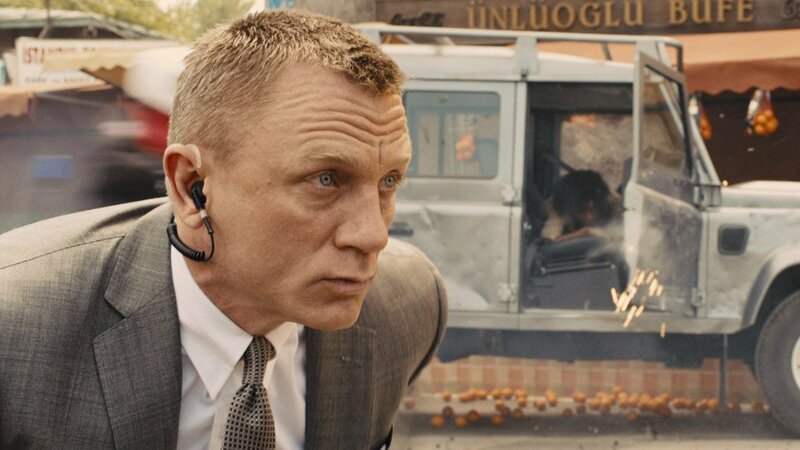 I’m not sure about the single vent on the dinner jacket and the fact that it’s more blue than black, but otherwise the skyfall wardrobe defenitely is an improvement – I hope it doesn’t change for the next film. (For the sake of novelty if nothing else!) I can agree with just about all of the above comments. Do the producers of Bond movies read the opinions of those with an appreciation for the character’s clothing, heritage and how the two should, ideally marry, on high profile blogs like this? No, sorry, stupid question. As Dan mentions, it’s a nice material and wasted on a dog’s dinner of a suit. The material of the tie too is attractive but, yes, too thin. The tab collar is an odd choice alright as it has no reference to Bond’s previous style and it’s not that it’s even used account of current fashions as with Moore’s late 1970’s or Dalton’s late 1980’s shirt collar choices). Perhaps it’s just a style Craig pushed for to be included? This current suit is as extreme and unpleasant as this from 23 years ago and 23 years ago there wasn’t too much criticism of Dalton’s choice either. In another 23 years, when suits of any kind are probably (sadly) relics this 2012 one will be viewed as another extreme fashion and Brosnan’s, Moore’s and Connery’s (all for the most part) will still stand the test of time. B. Take their own whims and apply minimal amounts of “A” to insinuate that their dilettante reinvention is somehow a genuine nod to the past. There are many aspects of Skyfall that do look to tradition and the series’ heritage. The clothing, however, was hardly one of them. Have you heard Jany Temime in interviews? She says the Bond style is something to respect, but she wanted to do something new that reflects today’s fashion. PS: If they wanted a fashionable style of suit in keeping with Bond’s status they could have done a lot worse (well, in fact they did!) than have gone back to 1969 and had a look at Lazenby’s wardrobe. Once again I agree with David; of the many attempts to make Bond “fashionable”, Lazenby’s wardrobe (minus the ruffled shirts) was by far the most successful. The glen check suit he wears in Gumboldt’s office is a perfect example of a suit that is youthful and even a bit “rakish” without going over the top. Granted, Lazenby was a former model with a model’s slender build, but the fact remains that the idea of the tightly-wound Craig/Bond “busting out of his clothes” needs to be given up. I can’t wait to see you dissect Mallory’s suits as they were my favorites in the film. Tanner’s weren’t bad either, but Mallory’s were timeless and very sharp. My wife was of the opinion a few years back that they should have considered Ralph Fiennes for the Bond role. It seems she may have been on to something! From what I can see from the images of his suits in this film, Fiennes does subtelty and distinction whereas the Ford stuff is just fashionable bling. I believe he was one of the contenders for “GoldenEye.” Don’t know if he got as far as a final screen test, though. The only descent look of the whole movie, the others were just awful, this look kind of reminded me of the 60s look; narrow tie that could pass for a grenadine because of the effect the pattern creates and the narrowness, and the flat folded hankerchief like in the famous goldfinger gray suit! 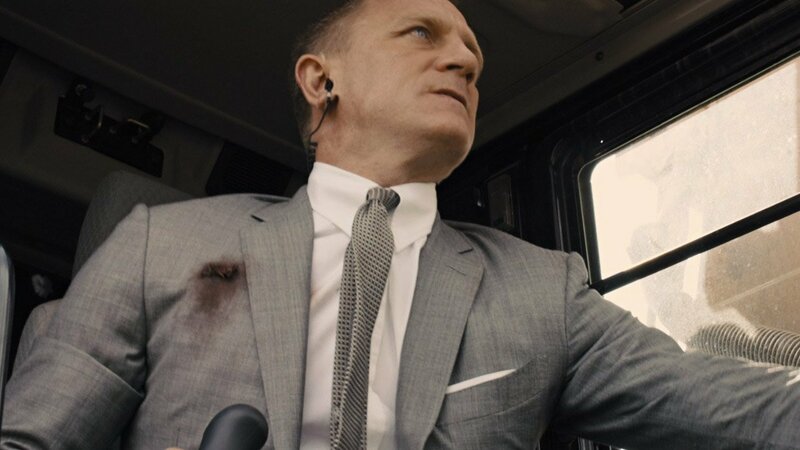 I just have one question, I have been looking for the Tom Ford tie which bond wears through this new movie Skyfall, but I can’t find it anywhere. Does anyone know where I can find the Tom Ford tie? Tom Ford has sold some of the ties (or similar ones) in wider width, but they don’t sell the ties as they appear in the movie. They sell James Bond ties, which do not match up with the ones in the movie. Magnoli Clothiers has an exact replica of this tie, HQ material at half or 1/3 of tom ford’s price. It’s not quite exact. It looks the same from a distance, but the weave isn’t done the same way. I messaged Magnoli concerning this tie, because for me it was surprising that he already had a replica of the tie counting the fact that the movie has just been released, i asked if pattern was 100% right or improvements in pattern accuracy could come, he told me that the tie is as close to the original as he can get basing it in high resolution images without having the original ford tie in hand. As a life long fan of Bond and also very appreciative of Tom Fords talents I was disappointed in Daniel Craig’s suitings. In my opinion they looked more Ralph Lauren’s Black label as well as “skimpy” and as a result cheap. Casino Royale and Quantam did both Bond and Ford right. I wonder if he is wearing the base A or base B model. 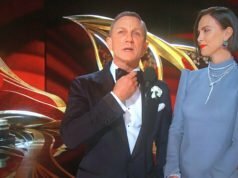 Does anyone else think that Bond’s pocket square handkerchief is just a little too neat? Connery was a big fan of the pocket square and generally affected the straight fold too, but somehow generally gave the impression that it had been elegantly stuffed into his breast pocket rather than artfully ironed and carefully placed. This really isn’t any different than what Connery wore. His handkerchiefs were also neatly folded. A linen or cotton handkerchief should be done this way, as opposed to Pierce Brosnan’s puffed silk handkerchiefs. I don’t think there’s anything affected with a simple fold. What’s affected are some of the fancy folds, like the 3-point or an accordion fold. Bond’s greatest wardrobe troubles always seem to result from getting a little too caught up in the trends. The over-wide lapels from Moonraker and the ill-fitting clothes from Licence to Kill are good examples. I’ve got no problems with the cuts flowing from narrow to wide and narrow again with the passage of time, but Bond calls for subtle nods to the shifting trends, not a full-fledged embrace of fleeting fashion. Skyfall over-did it, and made Daniel Craig look like he was dressed in grey cling-wrap. For that effect, I could get the same thing off the rack at J. Crew. Maybe I’m a little too harsh, but here’s to hoping the costume designer for Bond 24 goes a little bit more classic. P.S. Very much like the blog Matt. Maybe one of these days, I’ll be able to afford to act on all of this information. While I do think the fit is a too tight, I kind of like the color and style of this suit. I think the color and texture of the pick-and-pick material looks beautiful. A suit with this material with a more classic cut and double vents would be awesome!